A freelance editor and theological librarian, Nancy writes mysteries and fantasy. Her short story “The Secret of the Red Mullet” was published this past spring in the collection FISH TALES: the Guppy Anthology (Wildside Press). At the risk of sounding flip, the fact that they’re short! It’s so satisfying to be able to write up a first draft in a weekend (as I recently did) rather than taking months, as is the case with my novels. It’s also very satisfying to be able to get every little detail just the way you want without having to wade through the “sagging middle” and interminable edits of a novel. That said, I’ve come up with more ideas for novels than short stories so far. “Saint Nick and the Fir Tree” is definitely a favorite. The idea came to me one summer’s day when I was pruning a yew tree out in the backyard. The previous owner had shaped it like a little Christmas tree, but I noticed that it had gotten rather out of shape and the middle looked bulgy. Then my imagination kicked into gear and I got to wondering what would have caused such a thing. What if the tree had been out drinking with Saint Nick and developed a bit of a “beer belly”? From there I wrote up the story’s beginning and over the next few months, in bits and spurts, the rest of the story emerged. It’s a more episodic structure than most of the things I write, so I guess that’s why the story as a whole took longer to take shape. That Christmas I took it with me when I visited my parents. I had already decided to dedicate it to my mother because she loved Santa Claus and always insisted there really was such a person—even after we were grown! She also loved crazy stories and the whole thing really struck me as something that kind of channeled her spirit. She was really touched that I’d dedicated it to her, and reading it aloud to her and my father was a special experience. It’s particularly poignant to me because a few months after that she was diagnosed with late-stage breast cancer and died at the end of May. So I’m very, very grateful that she was able to hear it before she died and know it was meant for her. All through the fall when I worked on it, I felt this curious sense of urgency, as if I knew somehow it had to be completed before I saw my mother again. She and my father had been in poor health for a couple of years, so there was some basis for my feeling, but still, it’s as if somehow in my gut I knew it was the last Christmas I’d have with her. Mystery. Mysteries are the genre I read the most, plus as a writer I like the fact that mysteries have a built-in goal and structure; it makes the process of plotting less intimidating. Even “Saint Nick,” which is basically a fantasy, has a little mystery twist at the end. I just completed a short story for the Mystery Writers of America anthology competition. Because it’s for a competition, I don’t really want to say anything else about it—afraid I’ll jinx myself! I’m also writing the first draft of a suspense novel with fantasy elements. It takes place in Paris and the main character is a Jesuit professor of French there on sabbatical. I’m very excited about it. I took French courses all through high school and college and have visited Paris several times. I love writing about the city because it’s both familiar and exotic—not your run-of-the-mill setting. I first began to write seriously eleven years ago, though the urge to do so had always been at the back of my mind. For years I’d thought of writing, but didn’t know what to write about. It was only after doing some background reading for a theology course that I discovered the world of late antiquity, the period bridging the classical world and the Middle Ages. I was fascinated by the period because it was a transitional era when everything was in flux and cultural values were changing. It was a time when the old world of pagan culture and the new world of state-sponsored Christianity existed simultaneously and it’s fascinating to see not just the cultural clashes, but even more so the accommodations that people made, often co-existing side by side quite peaceably. It didn’t take long before this fascination led to the creation of a fictional late-Roman family and the beginning of my first historical mystery. I actually haven’t done this so much. 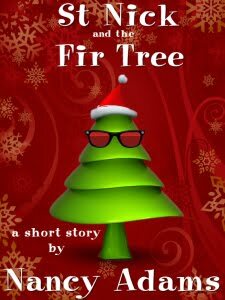 Other than “Saint Nick,” my short stories have mostly been inspired by anthology contests. “The Secret of the Red Mullet,” a short story that uses my historical characters, was written for an anthology sponsored by the Guppy chapter of Sisters in Crime. I was overjoyed when it made the cut and appeared in the FISH TALES collection this spring alongside other stories by my talented Guppy colleagues. As for other short story markets, the two most prestigious publications for mystery writers are the magazines Ellery Queen and Alfred Hitchcock. If I wanted to research other markets, I would probably ask around on the Sisters-in-Crime and Guppy lists. Anyone interested in writing mystery or suspense would do well to join Sisters in Crime. The organization is full of wonderful, encouraging folks, and it’s not just for women. I often get my best ideas in the shower. For a long time I wanted to be a veterinarian. I’ve always loved animals. After being a life-long reader, it’s such a thrill to see my work in print. I’m always happy to hear from readers, and they can contact me via my website. Thanks so much, Lisa, for hosting me today. You're quite welcome, Nancy. I'm glad to have you become part of my blog.